A: The Geneva peace talks on the Syrian issue are crucial to the launch of the "Syrian-led and Syrian-owned" political process in accordance with Resolution 2254 of the UN Security Council. Now into the fourth round since the start of this year, the talks have been moving forward steadily with some outcomes achieved. The peace talks have upheld the overarching principle of Syrian people independently choosing their own fate and built on the general direction of politically resolving the Syrian issue. 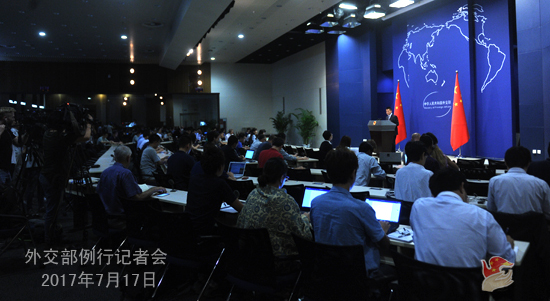 China always supports the UN in serving as the main channel for mediation on the Syrian issue. Special Envoy Xie Xiaoyan visited Geneva last week where he got in touch with representatives of the Syrian government and the opposition parties. He also met with Special Envoy to Syria Staffan de Mistura of the UN Secretary General and other major participants. He has made great efforts in promoting peace talks and moving all parties towards reaching a political settlement that serves the long-term interests of the Syrian people. At present, the situation on the ground in Syria is improving, and its counter-terrorism efforts are making headways. China would like to work with the international community to enhance coordination, accelerate the political process, contribute to ceasefire and cessation of violence, and jointly strive for an early, comprehensive and political settlement of the Syrian issue. Q: It is reported that the Venezuelan opposition organized a non-official referendum in which three questions were asked-Do they support the constitutional assembly? Do they want the armed forces to back congress? Do they support holding presidential election in advance? Reports say that the referendum, which is not recognized by the government, is a symbolic rejection of President Nicolas Maduro's plan to rewrite the constitution. What is China's comment? A: We have noted relevant reports as well as the rehearsals held on the same day by the Venezuelan government for the election of members of the constitutional assembly. In principle, China never interferes in other countries' domestic affairs. Meanwhile, as a friend of Venezuela, we sincerely hope that all parties in Venezuela could resolve their issues in accordance with the constitution and through dialogue so as to maintain national stability and economic and social development. 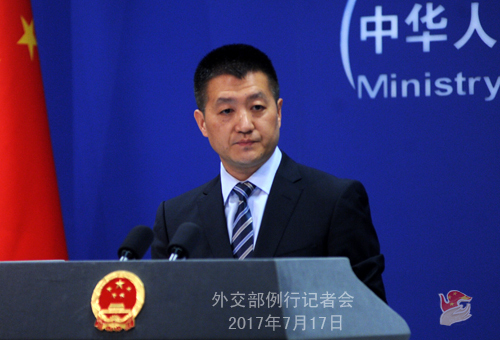 China hopes and believes that the Venezuelan government and people are capable of well managing their internal affairs. Q: The ROK government today proposed to hold military talks and the Red Cross meeting with the DPRK. What is your comment? A: We have noted these positive messages sent out by the ROK government on properly resolving the Korean Peninsula issue. We always believe that if the DPRK and the ROK could improve their relations through dialogues and work for reconciliation and cooperation, it not only serves their fundamental interests and the cooling-down of the tense situation on the Korean Peninsula, but also promotes regional peace, stability and security. We hope that the two sides can make joint efforts in this positive direction and create conditions to break the stalemate and resume dialogue and consultation. We also hope that all the relevant parties of the international community could be supportive and play a constructive role in the proper settlement of the Korean Peninsula nuclear issue. Q: The US State Department is going to require all countries to provide extensive information to help vet visa applicants so that they can determine whether the applicant poses a terrorism threat. Countries that fail to comply could face travel sanctions. Is this an issue that the Chinese government has discussed with the US government? Is the Chinese government concerned about this new requirement? A: We know that for some time, the US has been deliberating on strengthening visa application checks for foreign citizens. We hope that the US could protect the privacy of the applicant in strict accordance with the law and provide the necessary visa facilitation services as it should for relevant people's travel to the US for normal activities. Q: On July 14, the House of Representatives of the US Congress passed the National Defense Authorization Act for Fiscal Year 2018 which asks the US Defense Secretary to look into the feasibility of reestablishing port calls between the US and Taiwanese navies. What is your comment? A: The National Defense Authorization Act for Fiscal Year 2018 passed by the House of Representatives of the US Congress includes some negative contents, directing the Pentagon to submit a report to the Congress on the feasibility of reestablishing port calls between the US and Taiwanese navies. Relevant contents go against the one China policy of the US and the principles of the three joint communiques between China and the US and interfere in China's domestic affairs. 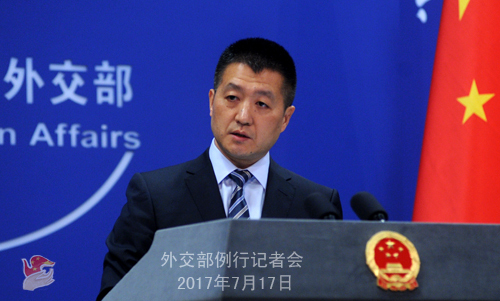 China has lodged stern representations with the US side. I must reiterate that it is China's consistent position to firmly oppose any official contacts and military exchanges between the US and Taiwan. We urge the US to fully recognize the gravity of the relevant clauses in the Act. The US should not allow the Act with the relevant clauses to become law, nor turn back the wheel of history lest it should harm the general interests of China-US relations. Q: Last Week, the North Pacific Commission held a meeting in Sapporo, Japan. In this meeting, Japan proposed to set a country-by-country quota for some fish, such as the Pacific saury. But Japan's proposal was rejected by several countries including China. Why did China reject Japan's proposal? A: I need to look into the meeting before I can get back to you. Q: The Iranian government yesterday announced a ten-year sentence for Wang Xiyue on the grounds of spying. Local media said that Wang is a US dual national. Considering that he was born in China, he is also believed to be a Chinese. Can you confirm that Wang has Chinese nationality? Does the Chinese government know anything about this case? Has China offered help to Wang and his family? A: We never recognize dual nationality, a policy of the Chinese government you should know about. You yourself mentioned that he has the US nationality. I can tell you for sure that as far as we know, he does not have the Chinese nationality.